Bird by Bird is a book about writing, for writers. You will know if this is you. Anne Lamott isn’t telling you much you haven’t heard before. You’ve read it all in writer interviews and blog posts and pep talks, in irritating articles that tell you not to use adverbs, in other writing books you’ve flicked through idly at the bookstore. Nevertheless, Lamott’s book is absolutely worth your time. She understands writers – she knows you, with all your writer quirks and weirdness – and she teases you about it. 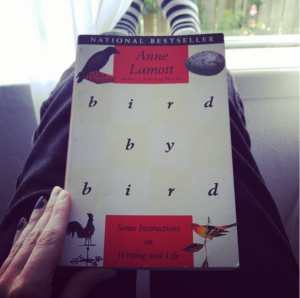 This familiarity, and Lamott’s warm, self-deprecating humour, is the heart of the book. It’s fine to read the Paris Review article about an author’s ensconcement in some writing retreat somewhere, about the library and the leather chairs and the piles of typed paper with scribbled notes in the margins. Let’s be honest, we all want that writing retreat, somewhere in the mountains in Canada, or perhaps in a little seaside village in Kent. What we have is messy, loud lives, in which we neurotically try to get something done, oscillating between “This is the worst thing ever written” and “I am a GENIUS!”, potentially within the same paragraph. Lamott understands that. She shares a lot of herself, little snippets of her life, her writing, her childhood. She talks to you like a friend, and in return, once she’s won your trust, she gently asks you to open up yourself, and to pour out the black tar that is your soul onto the page. She knows that’s scary, and she’s reassuring, encouraging, but in all things realistic. Not everyone’s going to be published. Not everyone who is published is going to have a bestseller. She’ll push you to create despite that, because writing, as she says often, is its own reward. Getting something done, something real, whether it’s a decent three-hour writing session or as many feeble words as you can scrape together, can be deeply satisfying. We are not in this for the Lamborghini. It’s a good read, worth it even if you already have 15 writing books on your shelf and are pretty sure Lamott isn’t going to say anything that Stephen King didn’t. It’s not like going to a lecture with a professor of literature. It’s like chatting on the phone with a writing friend, with a cup of tea or coffee and a dog asleep at your feet. Maybe it won’t tell you anything new, but you will underline passages just the same.